Turkey Ahead on Points, Still Need to Face South Africa. 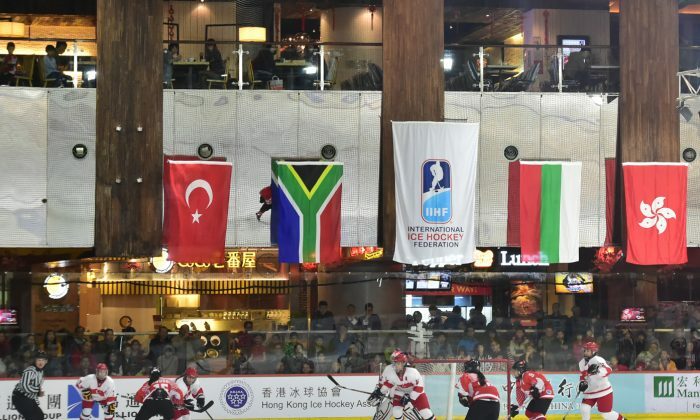 HONG KONG—Turkey moved into a 3-point lead with a head to head win over Hong Kong on day-2 of the 2015 International Ice Hockey Federation (IIHF) Ice Hockey Women’s World Championship Division II Group B Qualifier at Mega Ice, on Thursday Feb 19, 2015. Turkey who qualified for the 2014 World Championship but were immediately relegated again, overcame Bulgaria with a sparkling 11-3 win in their first match on Day-1 of the competition. Although Hong Kong had an important 4-3 win against the highly rated South Africa team on Day-1 they struggled to match a strongly performing Turkish team in their second match losing the game 1-4. Turkey therefore move onto 6-points while Hong Kong have 3-points. Second seed South Africa won their 2nd match against Bulgaria 6-0 to place them also on 3-points with Hong Kong. The Turkish squad celebrated in great style following their win against Hong Kong knowing that they were still on course to regain the World Championship qualification place. Talking to Epoch Times the English speaking Turkish goalkeeper Sera Dogramaci (who is also Australian) explained that they are not yet through after their second win “oops, one more game to get there!” she said. “We have a one day rest [Friday Feb 20] but still have training tomorrow morning, so we will make use of that. We will take it easy, do our recovery and do what we need to do to totally come on top of South Africa” said a very happy but determined Dogramaci. Talking about their match with Hong Kong she said “Hong Kong was the underdogs but as tournament hosts they had a lot of backing behind them. We did not expect them to be as strong as they were. There are a couple of girls in the [Hong Kong] team that I know, so I knew they were going to be tough, but it was a great game”. Asked how they adjusted their game after going 2-goals up, Dogramaci explained “we just had to keep that going, we played a little more defensively but one lapse of judgment and they had that break-away goal and they kept coming”. The Turkey to Hong Kong match was fairly even in the first 20-minute session but Turkey secured their first goal just before the end of session-1. In period-2 Turkey scored after 7-minutes to move into a 2-0 lead but the rest of the session was very even. Hong Kong struck back with a break-away goal just 2 minutes into the final stanza giving them hope of salvaging the match but Turkey stepped up the attacks and moved ahead to 3-1 just 3-minutes later. Turkey then stamped their authority on the game with a fourth strike with 10-minutes of the match remaining and played strongly to the finish. Cagla Baktiroglu scored three of the Turkish goals. South Africa, after their disappointment in losing their first match produced an impressive 6-0 win over Bulgaria on Day-2 taking them onto 3-points. Friday Feb 20 is a rest day which will be followed on Saturday Feb 21 with the final round of matches when Hong Kong play Bulgaria in the early match and then Turkey will meet South Africa. Should Turkey win or tie this match in regular time, Turkey will top the standings. But if South Africa win against Turkey in regular time and Hong Kong win against Bulgaria, there would be three teams on 6-points requiring complex tie breaker calculations to be undertaken to decide the final standings.